This is my last article for the ASHJ. I am forever grateful to the ASHJ team for the opportunity given to me to provide articles of interest for readers over the past 16 years, and for the feedback I have received from readers over that time. I retired from teaching at the end of June as I realised that if I keep going I will have been shoeing horses for 60 years next year and that sounded just too ridiculous. I decided to stop writing these articles at the same time as I stop teaching. The reason? I’m turning into a Grey Nomad and going fishing!! Fishing and golf are two things I simply never had enough time for in my life and are now high on my bucket list. 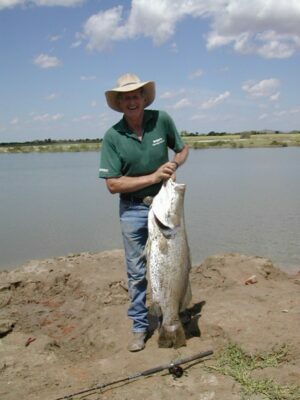 One of my first plans is to go helicopter fishing for barramundi with Tony from Katherine. I caught a huge barramundi with Shane Dunn when teaching on Legune Station about ten years ago and have never forgotten it. (Pic 1) I have played one game of golf in the past 20 years, and that was about ten years ago playing a round with my brother who plays most weeks. The fact that I beat him inspired me to want to play more golf. Thirteen years ago I decided to teach hoof care when I realised just how far the standards of farriery had fallen. My aim was to ‘make a difference’ which was probably like wanting to win x-lotto, and I certainly failed miserably at teaching farriers who stayed away in their droves; however what happened was what I didn’t expect, and I ended up teaching horse owners to learn what to look for and what to demand of their farriers; which is probably why the farriers stayed away in droves, and why my ears burn most of the time. I also plan to spend more time making information available online. When I started writing these articles for Australian Stock Horse Journal 16 years ago, I wrote each article on paper with a biro, which Anne rewrote more legibly and posted off to ASHJ along with photos printed at the chemist shop; remember those days? As technology improved, we took the articles to a secretarial service which typed them out on a data processor. It was a huge advance when we bought our first computer 15 years ago and I could write the articles and email the article plus the photos direct to ASHJ. 12 years ago I started a website and it now has over 200 pages offering free Hoof Care information and free consultations on Hoof Care to anyone anywhere in the world. Nowadays, technology has made a huge difference and this information highway is available 24/7. Any farrier who kids himself that he doesn’t need to be online and that he doesn’t need to keep up with what products and practices are available online and what people are discussing online has to be aware that 90% of his clients are reading about Hoof Care online. A few weeks ago I received a photo (Pic 2) from an owner distressed at her horse being so lame after a barefoot trim. I was so incensed at this brutality that I posted the photo on my Facebook page and had 7,500 hits in 24 hours. Technology Rules! 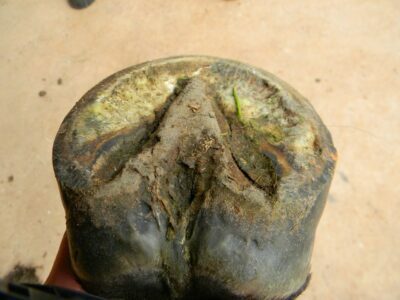 Horse owners are becoming more and more educated about hoof care and they want to know the reasons WHY a different technique has helped or hindered their horse’s performance. It is our duty as farriers to provide that answer to them, and in a format that can be verified scientifically. It is just not acceptable to say ‘that’s just what we do’ or ‘don’t you worry about that, I’ll fix it and it isn’t a problem’. A farrier who knows and understands exactly what he is doing will be able to explain to the owner as he goes along and in a format that can be verified scientifically. Over the last 20 years I have found one thing that hasn’t changed, and that is farriers’ inability to ask questions and to answer questions. The way around this is for all horse owners to keep asking questions of all farriers so that hopefully the farriers will get so tired of this that they might start finding out some answers. No professional person would ever consider that their education was complete when they started working or practising, but unfortunately most farriers consider when they have achieved their Certificate Three in Farriery, their education is done and dusted. Certificate Three in anything is ‘entry level’ into any trade and I believe that farriers should be tested annually to renew their Certificate Three in Farriery – this may stop a lot of the shortcuts being taken that are so detrimental to the horse. One problem that still continues to haunt me is the reluctance of many owners to put down a horse in extreme pain from hoof related problems, invariably because the horse ‘wants to live’ or ‘is still eating’. This is an incredibly selfish attitude and unfortunately there are far too many supposed hoof carers out there who are prepared to take money from these people for some ‘wonder treatment’ and let the horse endure months of excruciating pain instead of doing the humane thing and euthanasing the horse. Much the same is happening with rescue horses. If a horse is given for free, it is generally for a reason, and logic dictates it is going to be a high maintenance horse for life because of that reason. I have seen people attempt to rescue horses with a broken pelvis, terrible conformation, extreme club footedness, and extremely dangerous horses – it is cruel to be kind to such horses. Horse owners nowadays are generally much more informed than they were 20 years ago. A lot of that information is gained from the internet, and much of it is incorrect, and that is just the way with online information, which needs scientific backup. But it is important for horse owners to keep questioning WHY and not to just accept that it ‘just is’. I have to thank all readers for putting up with my continued carping over the years on barefoot trimming, club feet, quarter clipped shoes, trimming foals, flares, excess bars, excess sole and so on. Over the years I have been called many names, and one farrier even referred to me as a Witch Doctor. I was a bit offended by that until I thought about it and realised that the Witch Doctor was the person who did magical things and made people better, but the rest of the tribe didn’t understand what it was that he did, and I was quite chuffed in the end. But it is actually a real shame, as my mission in life is for people and farriers to easily understand how to correctly balance the hoof. I talk a lot about the Road Map of the Hoof and the three junctions. This is not just something I have found in text books, in fact I have never found it referred to in any book, magazine, article or clinic by any other farrier. It is a process that I have gradually identified over the last 59 years after being taught exactly what to do by Old Joe who was 84 years old when I was 14; he never explained why he did what he did and being 14 I certainly didn’t think to ask. There are three junctions that must be identified in every hoof every time to understand the Road Map in the Hoof. The hoof/sole junction is where the clean waxy sole meets the white line/hoof wall junction. The active tip of the frog is where the clean tip of the frog meets the clean sole. 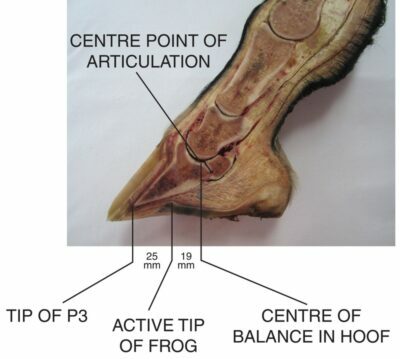 The critical heel/frog junction is where the widest part of the frog meets the solid hoof wall in a straight line from the active tip of the frog. The heels must NEVER be trimmed less than six millimetres above that junction. NEVER EVER. If you stick with this Road Map and follow my principles of balancing the hoof your finished work will be very consistent. The horse world is very small and gossip travels quickly and it’s amazing what comes back to me. I have heard of two part time farriers who have attended my courses and improved their technique considerably and became full time farriers who then went on to tell their clients that they didn’t agree with my centre of balance and that they had ‘improved’ on it by increasing the measurement from the active tip of the frog to the toe. In other words, they had lengthened the toe (Creeping Toe Syndrome) and lowered the heels (Long Toe/Low Heel Syndrome) to make it easier and quicker to finish the job (Can’t Be Bothered Syndrome). A foal should have its hooves inspected at ten days old. Club footed horses are a result of genetic throw back and should NEVER be bred from. All horses should be left barefoot for at least six weeks each year. A shoe is required when the wear rate exceeds the growth rate. Nails should be level with the shoe, not proud. A horse bears most of its weight on the hoof capsule. End of story. Quarter clipped shoes restrict expansion in the hoof and the detrimental effect can be felt in the coronary band directly above the quarter clips. The horse’s hoof has not changed, and if the hoof is correctly balanced then there is rarely any need for bandaid shoes of any sort. BECAUSE – if a horse isn’t trimmed and balanced properly barefoot, then no-one has any business putting shoes on that horse. I believe that everyone who trims a horse’s hoof has a duty of care to balance that hoof correctly. If you see me lazing around with a fishing rod or a golf club in my hands and you have a horse with a hoof problem, come over and say G’day, as it’s a sure bet my shoeing box will be somewhere in the A-Van.